← It’s a great time to be a Disney World fan! I’ve been going to Disney World since I was a little girl. During my many visits, I’d ridden all of the roller coasters. 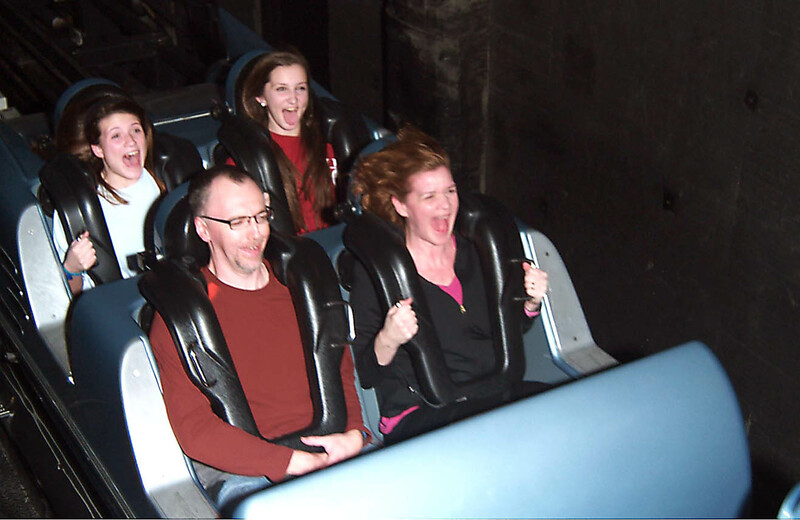 The Rock ‘n’ Roller Coaster at Hollywood Studios was my nemesis. This coaster and I had a complicated relationship; we danced a tango of temptation and trepidation. I wanted to ride that coaster, but I was scared. Sure, our son rode it as soon as he was tall enough, and loved it. Sure, I watched gray-haired parties standing in line, eagerly anticipating the ride I was too chicken to attempt. Sure, I’m a Disney fan AND a thrill-rider. So why couldn’t I bring myself to get in that line? What it came down to, I realized, was my claustrophobia. I don’t like rides that have an over-the-shoulders type of safety bar. Rather than making me feel safe, they make me feel trapped. On our most recent trip to Disney World, the last paper FastPasses we were able to obtain (EVER!) were for – you guessed it – the Rock ‘n’ Roller Coaster. Would I screw up my courage and finally conquer this ride, or would I let my last-ever paper FastPass go to waste? And it was awesome. The FastPass return line moved along fast enough that I was able to maintain my pre-ride composure. Once seated in the ride vehicle and locked into the dreaded shoulder harness, we were soon moving. And boy, did we move fast! So fast, in fact, that I didn’t have time to freak out over the restraint. I screamed with delight and kept my eyes wide open, trying to soak up every sight, sound, and sensation. It was glorious! And then it was over. Our vehicle came to a halt, and we waited for it to be our turn to disembark. That’s when the claustrophobia set in. Sitting there in the stock-still ride vehicle, clamped into place, I felt panic start to rise. Fortunately, my husband knew exactly what I was thinking, and kept me busy talking until we were released from the ride vehicle. Would I recommend this ride? Definitely. Will I go on it again? I hope so! How do you feel about the Rock ‘n’ Roller Coaster? This entry was posted in Disney's Hollywood Studios, Walt Disney World, Walt Disney World attractions and tagged Disney, disney trip, Disney World, Disney's Hollywood Studios, Rock 'n' Roller Coaster, roller coasters, travel, vacation, Walt Disney World, Walt Disney World recommendations, Walt Disney World rides. Bookmark the permalink. What a great story! Looks like the screaming was loud, but in a happy way. I don’t have a problem with tight places, but that harness has caused me some anxiety a time or two. Thanks, Lisa! I really loved this ride. I hope I’m brave enough to ride it again! You’re so brave to go on RnRC even once – it’s very intense. I’ve actually been on it once more since that first time. I never make a FastPass+ for it, though – it’s one of those “in the moment” things.